Hush Maderas is a boutique hotel located on a short 5-minute walk from the beach Playa Maderas. 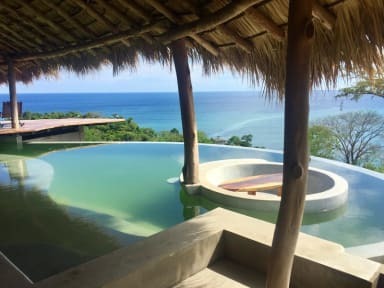 Hush offers an infinity pool with lounge area, 180 degree ocean views and a yoga studio. On the top floor we have an incredible rooftop where the most amazing sunsets can be watched everyday. Hush is a perfect place to relax, enjoy sunset yoga and surf on the waves that are there all year round. We are an eco-lodge and 100% off the grid and are proud to be running of solar energy. We are located in Playa Maderas near San Juan del Sur, one of the most marvellous places in Nicaragua. We are near to some of the finest attractions and landmarks of the area such as Cristo de la Misericordia and Museo del Chocolate, amongst other interesting spots in our area. Our private rooms have spectacular ocean views and our garden dorm view is beautifully overlooking the jungle. All rooms have an on suite bathroom, wardrobe and luggage space. For all rooms there is a patio with sitting area. The garden dorm has three double beds and one single. We have several common areas where the guests and the travellers will be able to get together and exchange past experiences and future plans. Payment upon arrival by cash (preferred), credit card or PayPal.